Right now, from where I’m sitting, I can see buds on the tree outside my window. Spring has (almost) sprung everyone! One of the most iconic spring celebrations on the East Coast is the cherry blossom festival in Washington, D.C. Even though D.C. is just a short drive for us, I’ve never actually made it there to see the trees in bloom. But this year, I’m bringing the festival to me and sharing some quilling paper cherry blossoms! Cherry blossom trees are hugely symbolic in Japanese culture and the trees in Washington D.C. were a gift from Japan in the early 20th century. They are characterized by small, light pink flowers with deep red centers and stamen. I think the light pink quilling paper by Quilling Creations is perfect for these flowers. To start, work on the petals of the cherry blossom. Glue 2 17″ pink strips together end to end to make one long strip. Roll on your quilling tool to make a tight coil. After you pull it off your tool, pinch to form a teardrop. Hold your teardrop between both hands. With one hand, push up from the center to form a dome, and push down right at the tip. This move will give you a slight s-shape if you’re looking at the teardrop from the side. Brush with a thin layer of glue to the teardrop keeps its shape and let dry. Repeat 4 more times to equal 5 petals. Add a tiny drop of glue between each petal and attach to form the flower. Next up is the center of the quilling paper cherry blossom. The center of the flower is usually a bit spiky. If you have a quilling paper fringer, now is the time to bust that out. I do not, so I improvised a bit. Roll a coil from a 5″ strip of deep red quilling paper. Using small scissors, make tiny snips along the outside layers of the coil. This technique will give the impression of a fringed coil, without the extra tool. If you’re planning on making tons of these flowers, a fringer might be something you’re better off springing for. Glue the fringed coil to the center of the flower. Use the same deep red paper to make the stamen of the cherry blossom. Cut 1″ strips in half lengthwise. Roll the strip about halfway and secure the loop with the smallest amount of glue you can. I like using a toothpick to apply the glue can be helpful in times like these. Make 6 more stamens for each flower. Try making some shorter to add a little more of a natural look to your flowers. When your stamen are dry, add them to the outside of the fringed coil at the center of the cherry blossom. Stop right here and you have some pretty springtime flowers for your next quilling project. Or, add them to some wire branches to look like they’re sprouting right off the tree! Roll a 22″ strip of the dark red quilling paper into a tight coil and push the center out for a dome. 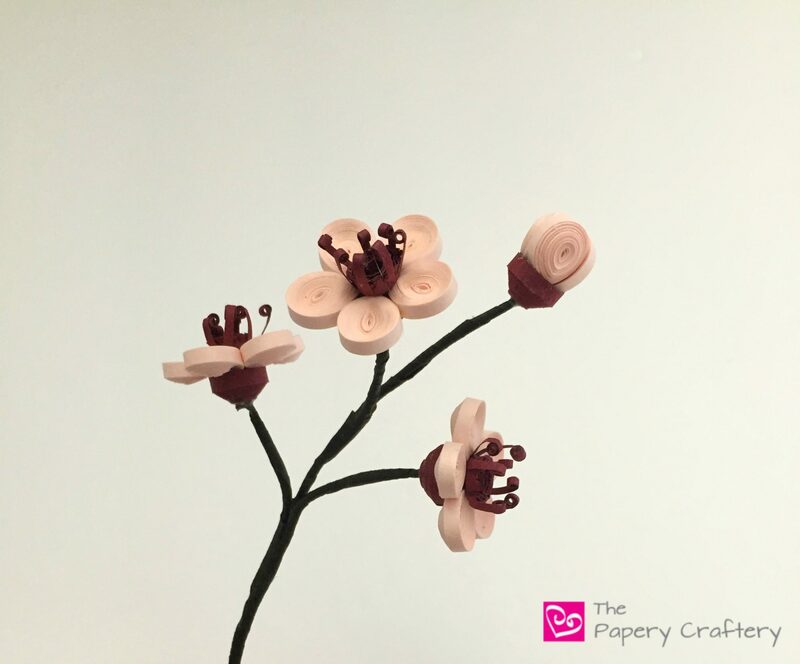 Secure to the back of each quilling paper cherry blossom to act at the base. You could also add some buds to your branches. Simply roll 3 more tight coils from the pale pink paper. They can be the same size as the flower petals. Shingle them like in the photo below to look like a flower about to open. The bud will fit in the same size dark red coil as the fully open flowers. The branches are remarkably easy to make and only require a couple of supplies. I used 18 gauge wire that I already had in my craft stash. I wrapped that with brown floral tape that I picked up at Michael’s. Once you have your branches the way you like them, simply attach the flowers from the back to the ends of the wires. Try Tacky Glue or hot glue here, depending on your patience level. Since cherry blossom trees bloom right at the beginning of the spring season, the branches don’t have leaves yet. If you’re looking to take a little artistic license with your branches, however, I’d recommend the high-quality crepe paper from Lia Griffith. 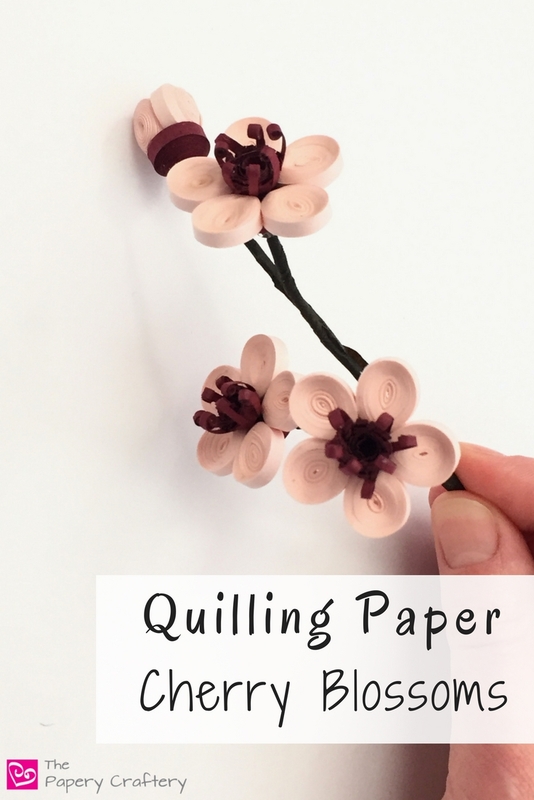 Making these quilling paper cherry blossoms has me ready for spring! They’re just the perfect bit of delicate color to shake those winter blues right off. What are you looking forward to as the weather gets warmer?